Didn't I mention, the other day, that I'd been following along over at The Fringe Association, with #slowfashionoctober? I think I did. The theme this week is "long worn". I haven't had time to write a post about it, what with things being the way they are round here right now; but it's been in my head. I've always believed in the notion of "slow fashion", since the day I first laid a pair of sharp scissors to the liberty print cotton which would become my school needlework project smock. It was slow, that's for sure: it took months for me to piece it together, in an hour a week. But when it was done, I had learned a lot: not even so much about sewing, for the teacher was no stitcher, but about putting care into something I was going to enjoy, about choices, about reward. And the thing is, I remember that still, now, and the remembering has become a part of that reward, even decades later. The smock had a story and it's for the pleasure of remembering just that kind of experience that I became a scrapbooker. Over the years I've been telling my story, I've recorded memories about many favourrite outfits. That's my kind of slow fashion. If I can hold a treasured item in my hands, pull it out of the wardrobe after years of its hanging there..that's good. If I can wear it again, or pass it on, bring it back to life..that's better. If I can tell its story and then step back and watch a new story emerge..well, that's as good as it gets. Four years ago now, I wrote about my Cool White Jacket and how I had bought it when I was a teenager, and how my just turned teenager daughter had spotted its potential. Now this week, and last, and over the summer and forward now to winter, she has been wearing the jacket on evenings out. And she's wearing it to the places it has seen before, in its first life. She wears it as she walks up the same road I walked on the night I met her father; and, yes, I was wearing it that night too. I can't show you a photo, because the jacket isn't here with me now. It's in Studentland, where it belongs. But I can reprint my original story, which I like even more now that I now it has a proper second chapter. Any bets for a third? A while ago now I made a page about Marie Antoinette. You might remember it. I liked it and I blogged it and I thought that was that. Until a couple of days later. The (Not So) Small One and I were lying side by side on the bed, staring at the ceiling and talking about clothes. She wanted to know if I had "any vintage" she could borrow - you know, old stuff from when you were young. And suddenly I made one of those strange connections, when something you've just done leads you to something you didn't know you were about to do. 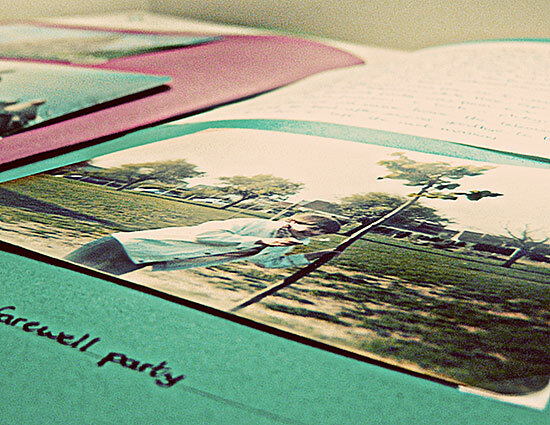 Scrapbooking is useful in all sorts of ways. When I was in France on that exchange trip I've told you about, one of our excursions was to Versailles. We saw the gorgeous rooms and the gardens where Marie Antoinette used to play at farming; but we also had a bit of time to wander round the town. We stared in the window of a second hand clothes shop and my friend Judith spotted a white denim jacket she desperately needed to have. Her Mum was a French teacher, and maybe that was what gave her enough swagger to march in there and buy it. The rest of us couldn't have managed it.. I still have my piece of white denim history and I told The (Not So Small) One the story and she got it and I pulled the jacket out of the wardrobe and she slipped it on and she was beautiful. So I let her keep it. She says she'll guard it with her life and I think she probably should. That jacket has stories of its own to tell. And I thought of the 80's with a smile. And she thought of the 80's and laughed. And we were both agreed that we each had it Just. Exactly. Right. Oh such a lovely story. Memories are like that famous quote ... is like a box of chocolates, you never know what you are going to get. Some, like this story are soft & sweet through & through & leave such a lovely sweet taste behind. I like the idea of the jacket tripping out and about again. My parents still live in the house we grew up in. When I occasionally open my old wardrobe door I cannot tell the disappointment I feel to find my teenage clothes are no longer there! Ah, how delightful - full of gentle Mum and daughter charm :). I like the thought of the two of you lying companionably on the bed talking about clothes ... Treasure that moment! I miss my girl a lot. A lovely story. Vintage is in and we all need to get away from fast fashion. It is so bad. lovely story Sian! How cool that your daughter wants to wear your jacket! Beautiful story - isn't it amazing how much memory a seemingly ordinary item can hold? A beautiful story ... I do hope TNSSO sends you a photo to share with us of her wearing it! Tell her I'm asking very nicely! I enjoy every story you tell, and think you are one of the best story tellers around. But this story----best yet. Love the long arc of time, and hope we'll hear even more about the white jacket in the future. What a wonderful history it has, with two special women! Oh that is a lovely gentle post - we still have the jackets Wookie & I bought way back in 1989 on our honeymoon. Can't see either of us wearing them again but they're still in a cupboard. I love your story and especially how your white denim jacket has been given a new life! There is nothing better than sharing with the next generation---when they really want what you have. Unfortunately, I do not have any clothing from the 60's, but it does make me happy when my "old" jewelry finds a happy home with one of the girls---even the grands. It may not be clothing, but I'm very happy that they also appreciate my needlework. Here's to recycling at its finest!